When we last departed .. more than a year ago .. ShuesBrews had just taken its first All Grain adventure – and then we fell asleep. Or something. 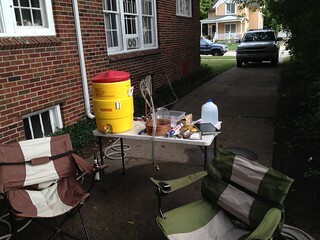 Actually, we’ve brewed 7 batches since then (5 AG, 2 Extract), acquired some new hardware and taken a few pictures. On April 21 we brewed a simple porter. This was our second AG brew and our 20th brew overall. It was a nice basic porter. We called this our Low Maintenance Porter because it had one simple hop addition at 60. Kind of exactly the opposite of our first AG brew. In August, after drinking some delicious Saisons all summer, we decided to make our own. We chose a Rye Saison recipe because we (I) love Rye beers. This beer was a hit. We still have a little tiny bit on tap but it won’t last long. 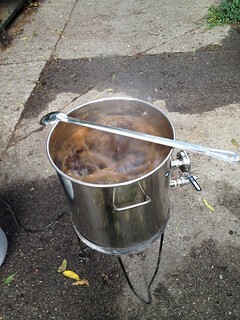 In the fall, we were starting to get our AG legs a little steadier and went for a Black IPA. If I had my way, we’d pretty much always have a Black IPA and/or a Porter on tap. We drained this beer. Black IPA is the sweet spot between Nick’s favorite beer flavors and mine. If we were stranded on a desert island ….. Since I last posted, we have done some damage the been inventory, and found a few open spots in the keezer again. Between time off for the holidays in Nov and Dec, and taking lots of growers to dinners and parties, we made quite a dent. In the time that has past, we have emptied out the Hefe (#8), the Citra (#9) and finally hit the bottom of our cider, which was the first experiment in fermentation we ever did, before our first brew batch in fall of 2011. The cider from the spring of 2012 had been aging for well over 6 months, so we get it in to a keg and carbed it. We are trying to take our time with it, as we have no cider in the queue at the moment. High prices and a busy fall means we never got around to doing a batch. I plan on doing some reading about store brand ciders/juices that work well for fermenting, and hope to get something started soon. So, currently, we have the Coffee Porter (#11) and the spring ’12 cider on tap. But, we’ve been brewing a bunch, so there is a few batches sitting under the bench fermenting or aging. In late November, we brewed a batch of Oatmeal Milk Stout, which is finishing up it’s 4 weeks of secondary aging in a keg right now. That should be ready mid Janurary. We’ve also did a blondish Vegas Gold (#13) kit from CNC, did another batch of the HMIPA (#14), the 60 Minute clone, and last night, we brewed up a batch of Fat Tire Snow Ryde (#15), which is a Fat Tire clone w/ rye added. The HMIPA is just about ready to keg, and 2 other batches coming up mid-Jan, so we should be able to fill those empty spots pretty quickly. Other other minor brewing notes are a cabinet in the basement to keep the brewing supplies, upgraded the brew bench by removing the warping chip board shelfs, and putting in some 5/8 ‘plywood shelves, using the higher quality ‘project’ indoor plywood. I also put some stick on vinyl flooring squares on the top, to make the table top more waterproof. I also expanded the chalk paint on the top of the keezer, to allow more room for writing. 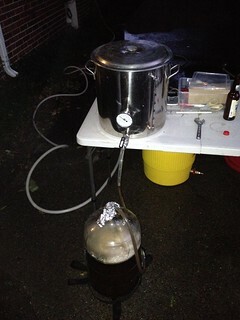 Below are some pictures from last nights brew. First time we’ve brew this late, or in the dark. My father’s Godzilla (#10) has been in a keg waiting for pickup for almost a month, but he finally got it this past week. 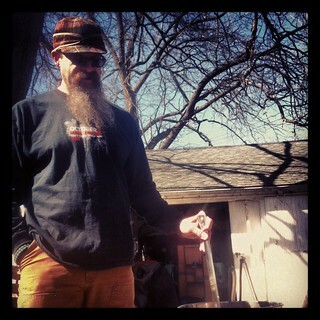 He doesn’t have a keezer yet, so he’ll continue to age it till he does. I finally got around to kegging the Coffee Porter (#11) this past weekend, and it’s been force caring this past week. Friday was the first good pint I pulled, and I’m rather pleased. Nice balanced coffee taste, and a smooth feel. I took a growler over a friends house this weekend, and everyone found it enjoyable. This one will go fast. Nothing in the queue right now, and the keezer is full (Coffee Porter, Hefe, Fall 2011 cider, and Citra Pale.) I also have the Spring 2012 cider in the carboy, waiting to step in when the other batch runs out. But, I need to get some things in the queue. With the Citra on the keg, I need to do something less hoppy (i.e, something that Marty will drink), then I can do a nice 60 minute clone again. 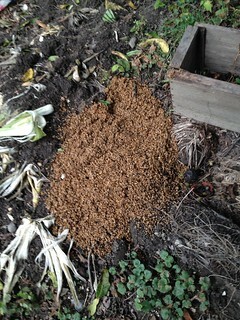 Perhaps that’ll be my first all grain? Yup, too busy drinking/brewing, not enough posting. The HMIPA is in the keezer, and is quite tasty. It’s defiantly a recipe I’ll try again. Since then, I also did a 2nd batch of the Black Tornado hop stout for my parents 50th anniversary party. in July, and this past week, my father called me to tell me that the beer have runneth dry. 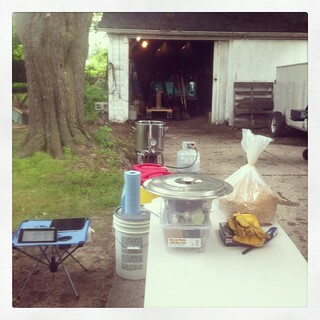 I also needed to get another batch rolling, so yesterday we did a double brew day. Started about 10:30 with a batch of Citra Pale Ale from CNC. It’s a nice pale recipe that uses only citra hops. My father stopped by about the time we were finished with the steeping, and was putting the pot on the turkey burner to start the boil. As something new this time, we also got some FermCap-S to prevent boil overs, and I have to say it worked out quite well. Much less problems with foaming, and less chasing the foam down with a spray bottle of water. Got that into the fermenter a bit into the afternoon, and grabbed some lunch from Seesburgers. 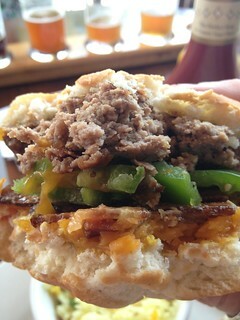 Wonderful sliders made fresh from fresh beef. Yum. My father is interested in starting to brew himself, so he stuck around for our send batch, so he could see a batch from start to finish. So, after that, we started a 2nd CNC batch, the Godzilla IPA. This was one of the recipes that cropped up during the hop shortage a few years ago, and uses unconventional hops. Sorachi Ace, a japanese hop. An uneventful brew, and we had that one wrapped up ~5PM. A little more then 6 hours to do both batches, a pretty successful day. On a coffee note, we just finished up a pound of Columbia from Dead River Coffee in Marquette (picked up while we were up there for the O2S race and vacation), and just brewed the first batch of their house Dead River blend this morning. Enjoying the first cup right now. Late last week, the Fat Tire from the Double Brew Day ran out, but fortunately, the next batch was just about ready to keg. The High Maintenance IPA (based on a 60 Minute IPA clone) was finishing it’s dry hopping in the secondary, and tonight, I was able to get it kegged. It’s setting in the freezer cold crashing, and I hope to be able to have it ready by next weekend, if not earlier in the week. This weekend, we brewed a batch of Black Tornado, which is also the first beer I ever brewed. I will be interesting to see if we can taste a difference. I’m brewing that for my parents 50 anniversary party on July 1st. The next two weekends are pretty booked, but I might squeeze in a batch during the week soon, if I’m feeling ambitious. If not, it’ll have to wait till later in the month. Marty has been suggesting either a porter of sorts, or possibly the Magic Hat #9 clone from the book we just purchased. Will probably post with more details on the brew days soon, but we have three batches in the carboys after a double batch Sunday. A few weeks ago, we did a Two Heart clone, which is in the secondary, and should be transferred to a keg this week. 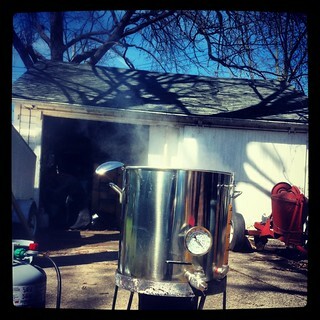 This Saturday, we brewed a Fat Tire clone followed by an English Pub Ale. The pub ale took off right away, but the Fat Tire clone took a good 24 hours to get rolling. Black Tornado and Autumn Ale are both on tap. Well, all of this work finally resulted in a final product: our own homebrewed beer on tap. The beer was actually transfered out of the secondary into the keg in the middle of February, but I had just got the keg chilled and carbonated when we headed up north to the Upper Pennsula for vacation. We’ve been enjoying the beer since we’ve gotten back, and I have to say I’m impressed with our frist batch. I wasn’t sure what to think when I first tried it. I mean, it wasn’t bad, but it wasn’t quite right. But, I think the carbonation was still settling in, as the pint I had the next day was much better. Marty had the same opinion about it’s improvement. But, then we left for a week, which probably helped the beer age a bit more, because going down pretty smooth now. One friend has tried it and found it tasty, but I have to have a couple more people sample it before it’s gone, to get a bit more feedback. I’m happy with drinkable the batch turned out, for being my first attempt, and knowing the various mistakes that were made. Goes to show that evening with some mistakes, you can still produce a fairly good, drinkable beer. The keezer itself is pretty much finished. I still have to get a drink tray, and also stain and hang the board for mounting it. I also have to put some foam on the inside of the collar. I removed the old foam when I was mounting the manifold and air lines. Steve had some dense pink foam left over from his keezer, so he gave me a piece to use. I just have to take the time to cut and glue it on. The taps look very nice all mounted up. I’ll probably get some nicer generic handles, but I haven’t bothered to start to look yet. I’ll know when I find them. The chalk paint came out quite nice. I’ve been letting Marty do that, since I’m unable to do anything readable. She’s been talking about spending some time doing something creative with it. We’ve also seen some liquid chalk pens that look like they could be very nice to use. Marty’s Autumn Ale is going to be ready for transferring into a keg by this weekend, and we should have it on tap next week. I also picked up a Two Hearted clone kit at Adventures in Homebrewing last weekend. We were downtown for a car show, and decided to go check out their store in Taylor, since I also needed a new keg for the Autumn Ale. We brewed the clone last Sunday, and I want to get another batch into the queue within the next couple of week. The cider should finally be ready to tap in April too, having been given a solid 6 months to age. You are currently browsing the beer category at Shue's Brews.